Art of the Bible is a website I made to catalog 5,800 freely available historical Christian-themed artworks on Wikipedia. 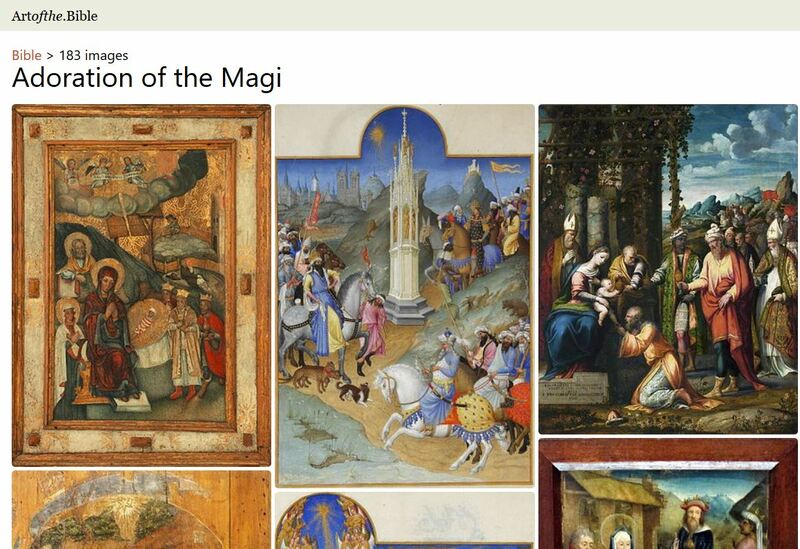 The site primarily focuses on European paintings from the 1400s to the 1800s that, at least in the U.S., should be free from copyright considerations. Arranged into 116 Bible stories, it relies on linked data to populate its database–which means you should be able to use these images for pretty much any purpose. The site uses Wikidata, a “linked,” or structured, data project from Wikimedia that annotates Wikipedia articles and Wikimedia Commons images with computer-readable data. Specifically, the site builds on Iconclass, a Dutch system for categorizing (mostly European) artworks based on their subject–for example: Eve takes the fruit from the serpent (or the tree) in the presence of Adam (who may be trying to stop her). Wikidata has an Iconclass property, so it was just a matter of finding religious art in Wikidata that didn’t have an Iconclass and then making 14,366 edits. All the data is available in Wikidata; the two SPARQL queries that power the site are for biblical and Christian art. Most images on Wikimedia Commons don’t have a corresponding Wikidata entry; I estimate that Wikimedia Commons contains at least 50,000 potential biblical artworks that aren’t on Wikidata. The frontend is a simple, static HTML browser; it’s full of JSON+LD if you’re into that kind of thing. This entry was posted on Thursday, November 8th, 2018 at 11:01 pm	and is filed under Art. You can follow any responses to this entry through the RSS 2.0 feed. Both comments and pings are currently closed.